Cobra Low Profile Plastic Zip Ties | Low Profile Cable Ties | Cal Fasteners, Inc.
Cobra low profile plastic zip ties are ideal for use in confined spaces, such as wire harness, control panel, marine, construction, safety equipment, and appliance applications. Cal Fasteners stocks low profile cable ties in 50 and 120-pound capacities in a range of standard lengths. Natural nylon or UV-treated black nylon varieties are available. In addition to reduced head height, Cobra low profile zip ties offer a number of advantages. They provide increased safety by reducing snags, cuts, and abrasions to cables, hoses, products, and users. They have no sharp tail cutoffs, as any remaining tail can be slipped into the head of the tie to eliminate exposed sharp edges. The flexible head design of these cable ties allows them to easily flex around bundled wires or tubing. Tamper proof pawls are designed to be inaccessible when bundled. ROHS compliant. 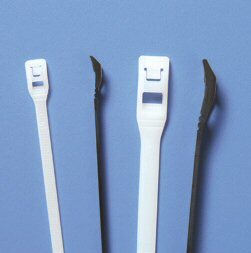 We also offer 50 and 120 pound cable ties in standard profile versions. Request a quote on the low profile zip ties you need, or contact Cal Fasteners to learn more.